From Giving Tuesday through Sunday, December 2, Goodwill stores throughout the Charlotte region are hosting a Goodwill Giving Tree event! 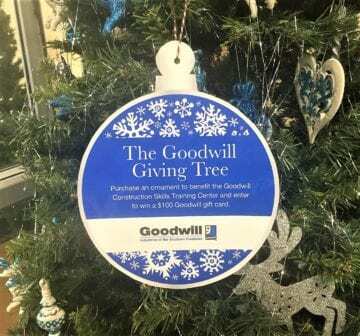 When you shop holiday ornaments at Goodwill’s stores, proceeds from the sale will help provide desks, chairs and technology for the Goodwill Construction Skills Training Center scheduled to open in early 2019. Additionally, shoppers who purchase ornaments will be entered to win a $100 Goodwill gift card to help with their holiday shopping this season! Goodwill will share updates on our social media pages throughout the week to show the impact of the community’s generous contributions to this much-needed facility. The Goodwill Construction Skills Training Center will serve hundreds of youth and adults each year as they earn industry-recognized credentials that help them access in-demand careers in the skilled trades – free of charge. Programs in areas such as masonry, electrical/HVAC, carpentry and more will help people in our community gain specialized skills to start promising careers – while also meeting the current demand for skilled trade professionals in the Charlotte region.